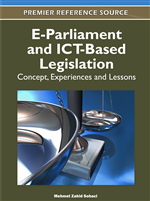 The use of information and communication technologies (ICTs) is increasing in legislative bodies around the world. The use of computers, cellular phones, and email by elected leaders has promoted the implementation of new ICTs to support various legislative tasks. Mexico is no exception to this trend, and there are some interesting initiatives at the federal and state levels. Based on the experience of the State of Mexico, this chapter has two main purposes. First, it suggests a methodology to assess a legislative web site and applies it to the case of the legislature of the State of Mexico. Second, it discusses the political implications of a website redesign project and explains why the redesign proposal never became a reality. The experience of assessing this type of website, building new instruments, and developing understanding about the phenomenon could be used as the basis for future research related to e-parliament, e-legislature, or e-democracy more broadly. Legislatures in places as diverse as Antigua and Barbuda, Guyana, the UK, and Zimbabwe all offer online information about their organization, the work done in committees, and the bills they are considering (Francoli, 2008). In Canada, the House of Commons is wired so that every Member of Parliament (MP) has access to a power source and a connection to the parliamentary Intranet and the Internet (Zittel, 2008). This level of access is predominantly framed as a means to foster a more participatory type of democracy by increasing the responsiveness of parliamentary decision making and the transparency of the parliamentary process (Zittel, 2008). The French Senate has a family of four websites targeted to different publics (Roy, 2008): (1) a general website for citizens and legislative professionals; (2) a website for children; (3) a website that represents different political bodies, like municipalities, counties, and regions; and (4) a web site for French citizens living abroad. These are some interesting examples of the use of information and communication technologies (ICTs) in the legislative branch. ICTs help MPs maintain good communication with their constituencies (Francoli, 2008). Information-rich online portals could also mean that MPs’ staff could find answers to queries relatively quickly and provide data more efficiently in the legislative process. In addition, legislative web sites are using ICTs to promote citizen participation. The online consultations on the UK Draft Communications Bill in 2002 are a good example (Francoli, 2008). Committee members discussing the bill were given summaries of a debate occurring on the online forum set up for that purpose. The site received close to 2,000 hits per day and over 200 comments. However, few parliaments use the Internet to connect citizens to the decision-making process and they do so in hesitant ways (Zittel, 2008). In France, they have AMELI (Amendments Online), which is the web application used in the French Senate for the 5,000 to 8,000 amendments introduced every year on the Senate’s floor. With AMELI, citizens have access to the content of the amendments directly from the homepage of the website, but they are not able to directly impact the political process (Roy, 2008). In Mexico, the dominant political party (the Institutional Revolutionary Party or PRI) recently bought iPads for all members of the low chamber in the Federal Congress. The use of ICTs is increasingly critical for legislators, to the point that it has become part of their political image. For instance, the PRI leader in the house described technology as very important for legislative activities and stated that without iPads congressional members could be considered digital illiterates (Guerrero et al., 2010). Later, the ICT department in the low chamber provided access to congressional sessions and voting using smartphones – specifically, the iPhone and Blackberry – as a way to continue modernizing the legislators’ activities (Simonnet et al., 2010). In the case of the Senate, a recent survey among senators reveals that very few of them have an official web page, but most of them use the Internet in their daily lives (Berlanga, 2010). However, the official websites of the Congress of Mexico –including representatives and senators– have become powerful tools for communication between legislators and citizens. Other applications also have the potential to uncover new relationships between citizens and legislators. For instance, a group of citizens in Mexico started a social network on Facebook called “Adopta un Diputado” (Adopt a Congressman) to monitor the actions and decisions of their representatives, creating an alternative channel for accountability.